After Space Coast, we decided to head to St. Augustine and Jacksonville. Driving Rover continues to get easier and easier, thank goodness! St. Augustine is a great historic city. Its official title is the “oldest continuously occupied European-established settlement and port in the continental United States”. Basically it’s the oldest constantly occupied city in the US, founded in 1565, which means there are a lot of historic landmarks in the city. Since we didn’t know what to go see, we decided to try the Old Town Trolley Tour to sample it all. 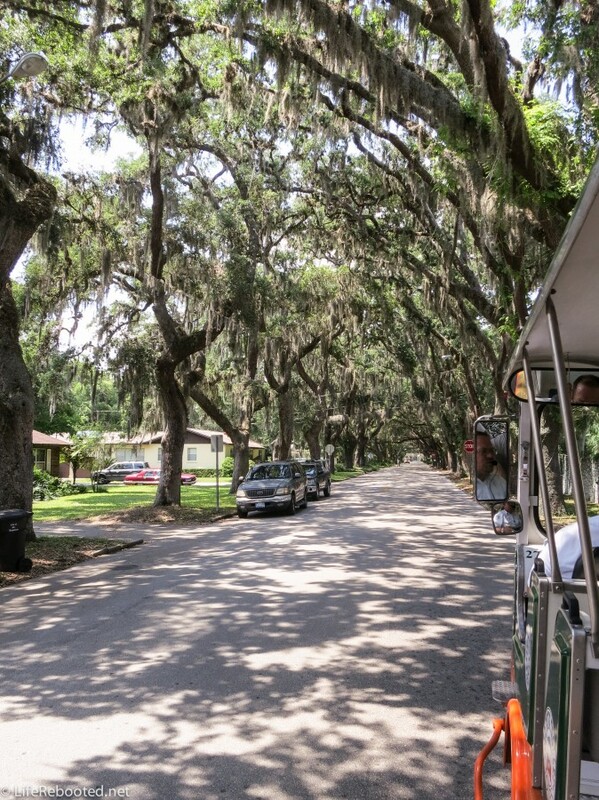 It’s a hop on/hop off trolley tour system, and they stop at 23 different areas around the city and the drivers provide some good narration about the city and its history. Plus you can use your ticket for three consecutive days (we used it for two days). We went on Friday and Sunday (Memorial Day weekend). Friday wasn’t too bad although it looked like a few schools were doing field trips that day. Sunday was definitely a mess with everyone out in the city for the holiday weekend. 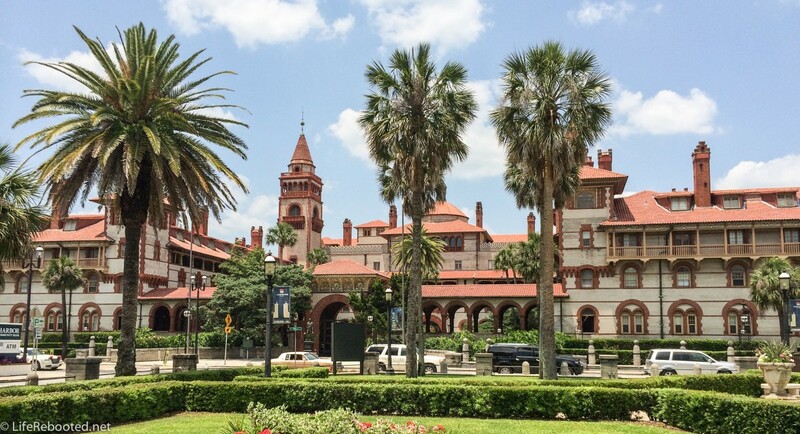 St. Augustine has some very nice attractions and I’d consider it a city worth visiting again. 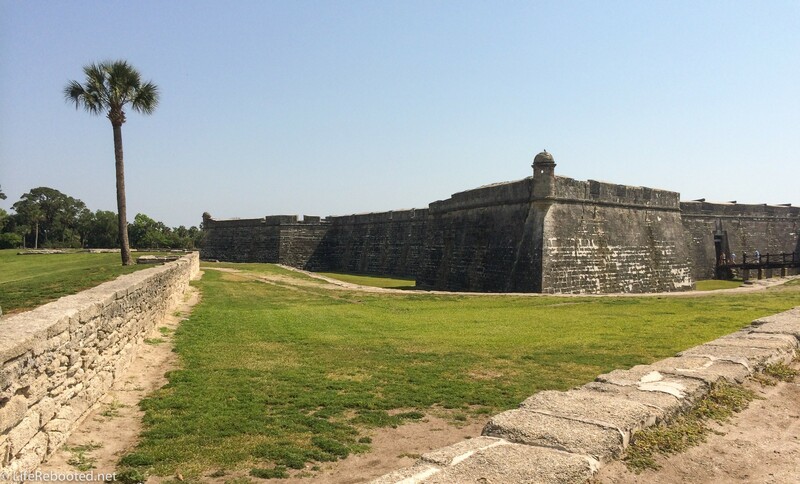 Castillo de San Marcos is one of the oldest forts in the US. It was burned down a few times until the residents learned that wood may not be the best building material. It was rebuilt using coquina, rock that is made out of thousands of seashells compressed together over time. The coquina wouldn’t burn and instead of shattering when hit with cannon balls, it absorbed the cannon balls. The military would then just plaster over the cannon ball and no one would ever know. 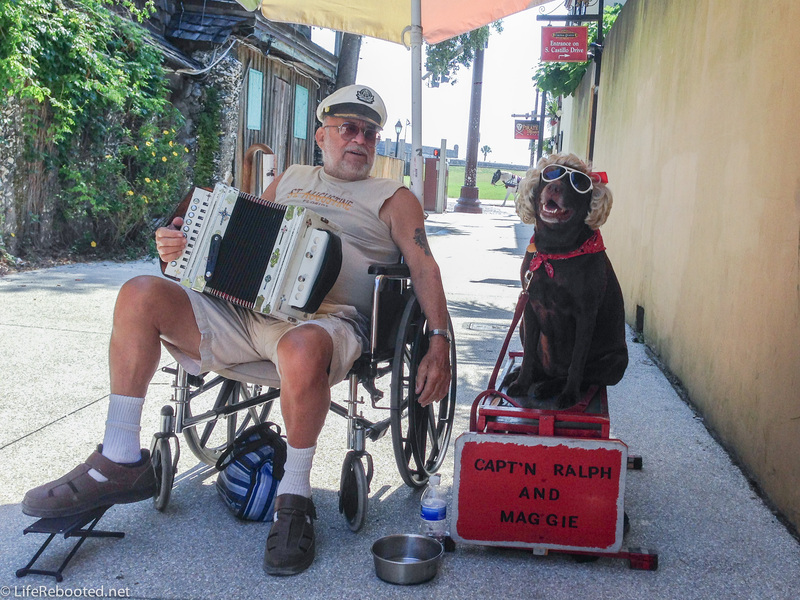 This fine looking lady (and her owner) played us a tune. 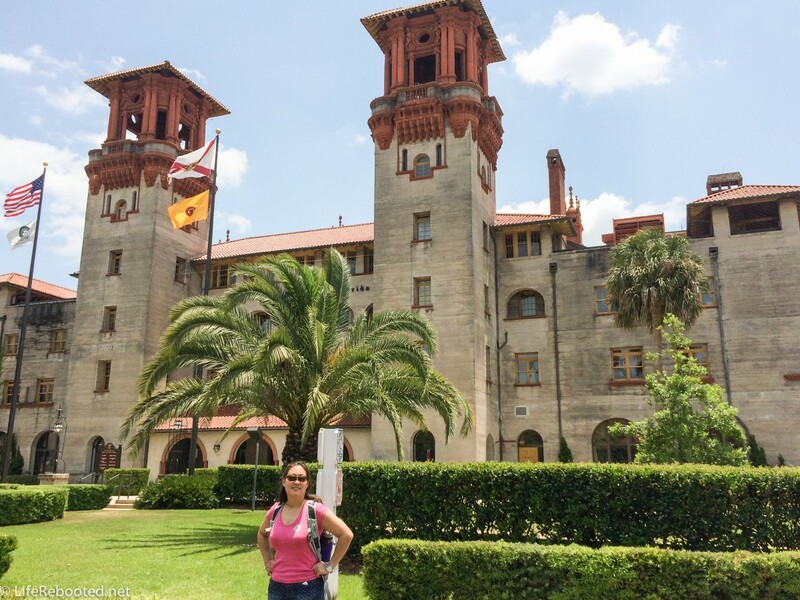 We also saw Ponce de Leon hotel, now known as Flagler College (pictured at top of page). The hotel was only for the obnoxiously wealthy or U.S. presidents. If you wanted a room, you had to keep it for the entire 3 months the hotel was open each year, no matter how long you wanted to stay. The dining room windows were created by Louis Tiffany and are still there today. Flagler College has two tours/day but our timing never worked out so we weren’t able to catch one. The Memorial Presbyterian Church was built by Flagler in memory of his daughter (died in childbirth) and granddaughter (stillborn). He wanted it built within a year of his daughter’s death so he could have her first year memorial service inside the church. It was built in 361 days with workers working in shifts around the clock to finish it in time. The church is pretty amazing and quite beautiful. If you have the chance, it’s worth the visit. Nombre de Dios (“Name of God”) is a spanish catholic mission with a 200 foot stainless steel cross placed where Admiral Avilés landed with his fleet and discovered St. Augustine. The first thing they did as soon as they landed was to hold a Catholic Mass led by Father Francisco Lopez to thank God for their safe landing. There is a shrine to the Blessed Virgin Mary that was destroyed and rebuilt that is still used, gravestones from the 1800s, and a small museum on-site. It’s a gorgeous park and rather soothing after fighting crowds all day. On the more modern side of St. Augustine, we also stopped at the San Sebastian Winery to sample their various wines and the Whetstone Chocolate factory for the chocolate tour. 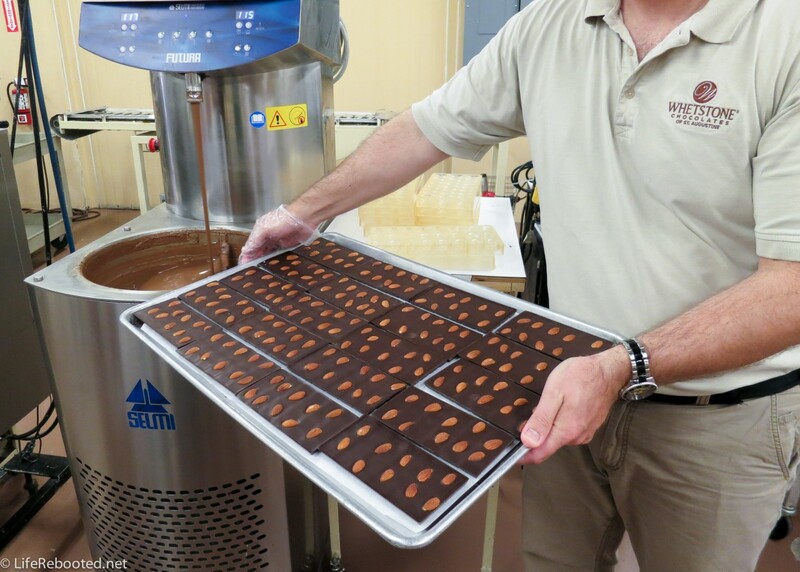 The chocolate tour was fun but definitely more worthwhile if you go when the factory is opened. We went on a sunday so it wasn’t actually operating that day but still great to see the various machinery. Of course the chocolates were quite good and we had to take some home with us. The wines were only ok and we did not end up taking any of those home with us. We did see a fair bit of St. Augustine but we still only scratched the surface. There are so many places to see and things to do that it’s worth a visit if you’re in the area.